Q. We plan on doing a trip like the ones you suggest, but we have a 35' 5th-Wheel. Would it fit in the campgrounds you suggest? I just want an idea of how many of your suggestions we can expect to use. Marianne's Reply: I can actually provide a fairly accurate answer to your question. We have personally visited every camping area in the guides. I know many of you drive a larger RV than ours but I've taken that into account. A footnote index in each guide gives you my opinion of approximately what size RV - (small - no longer than 24') or large (24' to 35' length), can access each and every campsite in the guides. Often much longer trailers and motorhomes will be fine but, if your RV is longer than 35', I urge you to drive a tow vehicle or walk in to check conditions for yourself. 76 of the 106 suggested camping areas in the Arizona guide should be okay. 82 of the 93 suggested camping areas in the Southern Texas guide should be okay. 64 of the 112 suggested camping areas in the Southern Utah guide should be okay. 59 of the 80 suggested camping areas in the New Mexico guide should be okay. 69 of the 95 suggested camping areas in the California Desert and Eastern Sierra guide should be okay. By state law, motorhomes over 40' are prohibited from many of the highways along the routes in the California Coast and Mountains guide. 63 of the 136 suggested camping areas should be okay. You'll have the information for each location at your fingertips in the guides. Of course conditions can change over time and with each season, so you'll always have to use your own best judgement. As I say in the guide, I tend to err on the side of caution and it's my best guess. Very difficult to gauge exactly when there are factors like turning radius, entry road conditions, and how many other vehicles may be parked in the way. I would not want to be responsible for a problem. Thank you for ordering the guides anyway. Would love to hear your opinion of how often and where I may have guessed wrong. I understand the frustration of Anonymous in 2015 who feels out of luck because they drive a large rig. We have a 35’ Class A. While I understand that you have to draw a line in determining what would distinguish a large RV from a small, I think calling a large RV anything from 24 to 35 feet is like saying a gorge can be anything from Bolton Notch in Connecticut to The Grand Canyon. There are a ton of places we cannot go in our 35’ class A that a 25’ Winnie View could easily access. Driving our motorhome to 6 potential boondock sites, unhooking the toad, driving in, exploring it, ruling it out and driving on to the next to repeat the procedure could be an all day process! Mind, you, that’s just a comment. I’m still ordering your guides as we set out on our first ever cross-country adventure as we do want to boondock out west, and your guide sounds like it will provide much of the information we need. 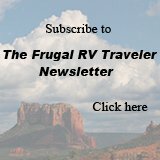 This website has useful information about low cost RVing. As Canadians we have been spending five to six month in the US and Mexico each year for the past nine years. We drive a 33ft 5th Wheel pulled by a Ford F350 Diesel. We travel with two dogs. This past winter we completed a 21000 km (13000 miles) road trip. We drove from Kingston, Ontario to visit friends and family in Vancouver. Our route took us across the northern states, the Badlands and the Black Hills of South Dakota, Yellowstone NP, then into Montana, and a stay in Seattle. Finally after a month, it was up to Burnaby Cariboo RV Park, in Vancouver area for six weeks. The next leg took us slowly down the Oregon / California coast to Desert Hot Springs CA. This was followed by a faster trip down to the Rio Grande Valley in Texas. The trip home took us along the Gulf of Mexico to Florida and then home for April, as soon as the snow cleared. You cannot "free camp" all the way unless you stay in the Arizona New Mexico, California area. But you can control campsite costs. Two resources that we find valuable are: 1. "The Next Exit". This book tells you, amongst other thing, what gas stations sell Diesel and are able to take a big rig in and out. Very Important. 2) We are members of Passport America (PA). 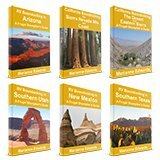 With PA Membership you get a book that lists of RV parks that give Passport America members 50% off short stay, nightly rates. We have found that most of the listed RV parks are off the beaten track, and are therefore in great locations. Caution use a GPS with caution, cross check with a map. Our GPS will insist on cutting corners and has taken us on some very interesting back roads. Enjoy RVing, and yes the Wheeling it Blog is well worth the read.
" Often much longer trailers and motorhomes (than 35 feet long) will be fine but, if your RV is longer than 35', I urge you to drive a tow vehicle or walk in to check conditions for yourself." We see many rigs of all sizes, even giant buses parked in many of the boondocking areas we visit in the southwest. Looks like my husband and I are out of luck. We have a 39 foot 5th wheel. We're planning a 3 month trip from Vancouver, BC. to New Mexico starting in September. Guess we'll have to stick to State Parks. Anyway your web site is fascinating and full of information. Grateful I found it. We used to go to RV resorts but that's not for us anymore. Want to see the country. Have never bookdocked because I thought my rig was too big. Just reading the information on your site gave me hope but maybe not. I've been wondering the same thing, as I'm sure many others have too. So thanks for answering that question.